Over the years there have been a number of attempts by the Southern Commandery to provide a space in a church building that could be dedicated to the Order and in which could be housed some of the Southern Commandery’s possessions. It was not, however, until 2003 that a successful result was achieved, after Chevalier Pyle, at the time Commander of the Southern Commandery, had made an approach to the Order of Saint John of God for permission for the Commandery to have one of the side chapels in the St John of God Chapel at Halswell, near Christchurch, dedicated as a sanctuary of St Lazarus of Jerusalem. Brother Peter Burke, the Head of the Order, readily gave his consent, and arrangements for the dedication could proceed. 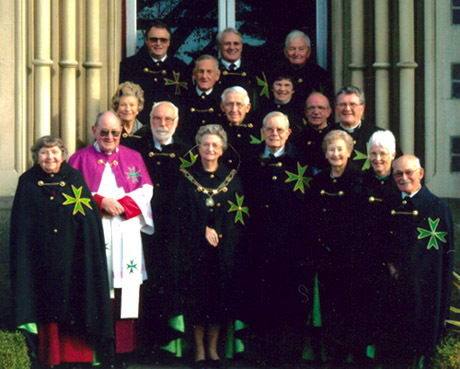 The Chapel of St John of God has been the venue for a number of Southern Commandery functions in recent years, most notably the Mass held on the occasion of the visit to Christchurch of the Grand Master, and the banner of the Order has been processed into the chapel on a number of occasions, but to be seen only by our guests on these occasions. With the side chapel being made available for the Order, and with the granting of permission for the banner to be displayed in it, alongside a short history of the Order, it would now be possible for all those who visit the chapel for any one of the uses to which it is put, to learn something about the Order and its work. 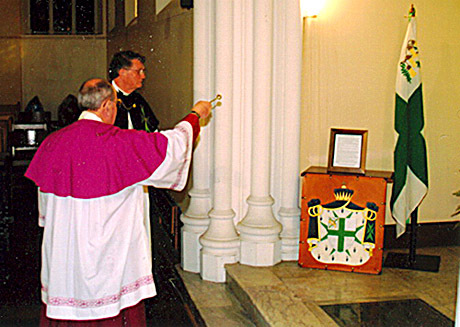 The day chosen for the dedication was 21 June 2003, and the actual dedication was included as part of a service to celebrate the feast of St Lazarus. While the day set aside traditionally for that feast is 17 December, some authorities do give a mid year date, and the Commandery chose a day close to that date. The Rev Monsignor O’Connor, assisted by the Rev. Gavin Yates, conducted the service and Dame Jess Mellish and Chevalier Alan Polaschek read the lessons. 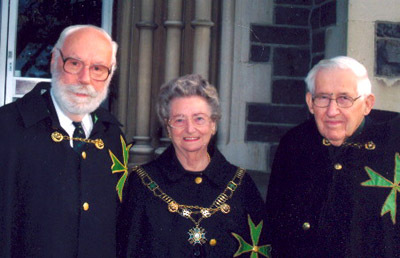 Following the service members of the Order proceeded to the Grenada Lounge adjacent to the Chapel for lunch, at which the Grand Prior presented Chevalier Derek Larnder with a certificate of appreciation from the Grand Master for his work for the Order over many years in identifying at the Commandery’s free cancer spot check clinics melanomas and other life threatening skin conditions. A short time before the service Chevalier Edward Roberts had celebrated his ninetieth birthday, and to celebrate the occasion he was asked to join the Grand Prior and the Chancellor for a photograph which is reproduced below.